Yamaha India has stricken the carburetted versions of the FZ-S and Fazer, along with their scooter, the Ray, from their rosters. Just recently, Yamaha has chosen to discontinue the carburetted version of their ever-popular FZ-S, as well as its semi-faired cousin, the Fazer, in India. The news isn’t shocking, as the updated models that Yamaha had launched in 2014 in the form of the fuel-injected version 2.0s were receiving relatively better responses from Indian motorcycle buyers. The version 2.0 motorcycles feature a new version of the original FZ’s 153cc single-cylinder motor, which is built around Yamaha’s BlueCore philosophy that the company claims is to maximise fun without compromising efficiency. And efficiency is one area where the new bikes really outdo the older ones. So it was natural that Yamaha chose to discontinue these older models. However, the base model in the FZ family, the FZ16, which is basically the first one of these which Yamaha had launched back in 2008, is now the only non-fuel injected of these still on sale in the country. Yamaha has also pulled the plug on its first-ever scooter for the Indian market, the Ray. The Ray was specifically designed with women riders in mind, and the company launched a more male-oriented version in the form of the Ray-Z later on. Sources in Yamaha India also said that the company was looking to now focus more on their latest scooter, the Fascino, which is apparently making waves as a ‘fashion-segment scooter’. In any case, Yamaha India is looking to launch the Ray-ZR, a new version of the Ray – which was unveiled at Auto Expo 2016 – in the next couple of months. This new scooter features the same 113cc Blue Core engine from the Ray, but gets an optional disc brake at the front, alloy wheels along with revised body panels and styling. As of now though, the Ray-Z still continues to be on sale. A set of images showing the final design of the Toyota C-HR based crossover surface online ahead of its official debut. The production version of the Toyota C-HR concept has been leaked ahead of its official reveal at the Geneva motor show. Leaked pictures, published on an American news website, confirm Toyota’s new crossover has stayed true to the design philosophy of the concept, with the five-door crossover flaunting bulging arches, angular lights and a coupé-like roofline. The new model is based on Toyota’s New Global Architecture (TNGA), which is shared with the new Prius, Swiss Fake Watchesand makes use of hybrid power. Toyota previously said it would be the first hybrid in this class, though it is not yet known if a conventionally powered alternative will be offered. The C-HR is expected to be powered by a four-cylinder powerplant for its internal combustion engine, paired with a CVT gearbox and an electric motor. It will sit below the RAV4 in Toyota's range in the international markets. A racing version of the C-HR has also been revealed, and will race at the Nürburgring endurance event this May. When it goes on sale, the C-HR will rival Replica Breitling Watchescrossovers like the Fiat 500X, Jeep Renegade, Mazda CX-3 and Nissan Juke. Bentley is looking to develop its customisation division, to manufacture bespoke versions of its road vehicles. Bentley is exploring ways to develop its customisation division, Mulliner, to offer bespoke versions of the carmaker’s road vehicles. A six-seater version of the Bentley Mulsanne is set to be revealed at the Geneva motor show, and will be called the Bentley Grand Limousine by Mulliner, with each car built to order. Mulliner has long customised car colours and specs to customer requirements, and when asked by our sister publication Autocar UK if the highly re-engineered car signalled a new direction for Mulliner, Bentley boss Wolfgang Dürheimer said: "Yes, I think we can do more. "Mulliner is an asset with a history nearly 500 years old, but it is not a well-known name and we must change that. It's an asset, both for customers and for us to develop one-off ideas and see where they lead. It is somewhere exceptional ideas can take shape, and small scale ideas can be developed to larger scale ones." Asked how far Mulliner could go, and if it could revive the art of coachbuilt one-offs, Dürheimer added: "It's possible, yes. The only thing to say is that Stefan Sielaff is the design director, and what he says is the rule. If someone wants a Bentley that looks like a tank, then he will say no. "But if a customer demands something unusual but tasteful, then why not? We'll explore all ideas - our capabilities do not end with the standard option list, but extend to Mulliner." Dürheimer also added that customer safety must come first and that any change that could alter the aerodynamics, suspension or weight balance of the vehicles needs careful consideration. Royal Enfield, the world’s oldest motorcycle brand in continuous production, has introduced a new colour – Squadron Blue – for its Classic 500 range of motorcycles. The bikemaker says the inspiration for the new colour variant has come from the Indian Air Force and is a tribute by Royal Enfield for its longstanding history with the soldiers of the skies. Commenting on the choice of colour, Rudratej Singh, president, Royal Enfield, said, “The Classic 500 Squadron Blue is a tribute to Royal Enfield’s war-time presence and association with the armed forces. We wanted a variant with a genuine armed forces heritage for our customers and for this, Royal Enfield turned to the Indian Air Force for inspiration. We had to be very particular about the colour to create an authenticity and also provide the motorcycle its post-war appeal. This inspiration led us to create the Classic Squadron Blue which is now available at price of Rs 186,688 on-road Delhi.” Royal Enfield’s tryst with the armed forces began way back during the World Wars where the motorcycle was extensively used by the British Army. The manufacturer received its first-ever order from the Indian Army in 1952 for 800 motorcycles. The company started production in India from 1955 onwards and has been supplying to the Indian Army ever since. The Indian Air Force also started using Royal Enfield in the 1950s and it has been most popularly used by the Air Force Police. Royal Enfield's motorcycles continue to be one of the commonly used motorcycles in the Indian armed forces and also state police. The Classic is one of the most successful products in the Royal Enfield stable and has been the company’s bestselling model. The new Squadron Blue variant is powered by the 500cc Unit Construction Engine. The motorcycle is available at an on-road price of Rs 193,372 in Mumbai, Rs 189,350 in Chennai, Rs 198,649 in Bangalore and Rs 196,700 in Kolkata. It may be recollected that Bajaj Auto’s recent move to introduce its V brand of motorcycles, which embodies metal from India’s venerated aircraft carrier, the INS Vikrant, has seen a handsome response from motorcycle enthusiasts and the general public. Earier today, the company announced the bike's pricing at Rs 62,000. Expanding its global dealership network, Royal Enfield (RE) inaugurated its first dealership in Thailand. 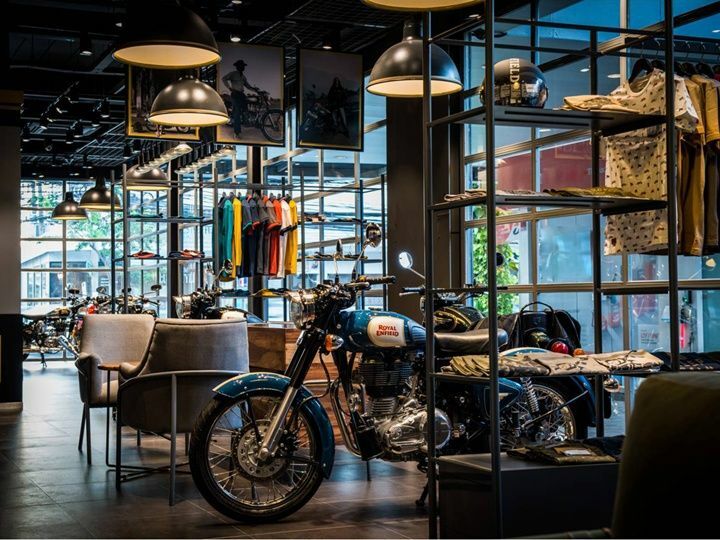 The new Royal Enfield showroom has been situated in the capital of Thailand at Bangkok. The first RE retail store in Thailand has been set up by General Auto Supply Co. Ltd. The complete portfolio of its motorcycles will be made available at the new dealership alongwith the official Royal Enfield apparel and accessories range. Royal Enfield has been expanding its global retail footprint across UK, Europe, Latin America, Middle-East and now in South East Asia. Its latest store in the Southeast Asian market prior to Thailand was in Indonesia. Royal Enfield announced its entry into Thailand, the fifth largest two wheeler market in the world in Dec 2015, at the Thailand International Motor Expo. The Royal Enfield Thunderbird 500 has been priced at Rs 3.45 lakh in Thai market while the RE Classic 500 retails for Rs 3.64 lakh and the Royal Enfield Continental carries a sticker price of Rs 4.21 lakh.